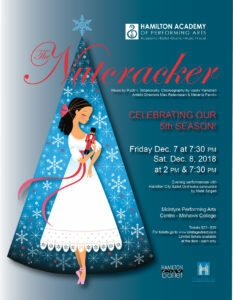 THE NUTCRACKER ~ Celebrating our 5th Season! We are excited to announce the upcoming performances of Tchaikovsky's THE NUTCRACKER! Staged by Max Ratevosian and Melania Pawliw, produced by Hamilton Academy of Performing Arts in collaboration with Hamilton City Ballet and the Hamilton City Ballet Orchestra, conducted by Maestro Mate Szigeti (evening performances only). With the participation of over 100 performers, we are happy to welcome dancers from Hamilton & surrounding areas from as far as Thornhill, Mississauga, Oakville, Burlington, Stoney Creek, Grimsby, Brantford, Waterdown, and more! Tickets are going fast! We hope to see you at the ballet!